Wolf Rawicki (later Ze'ev Raban) was born in Łódź, Congress Poland, and began his studies there. 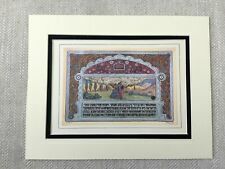 Rare Colour Lithograph Folio Plate from 'The Song of Solomon' Circa 1930 - Ze'ev Raban. Ze'ev Raban. Under the influence of Boris Schatz, the founder of the Bezalel Academy, Raban moved to the land of Israel in 1912 during the wave of immigration known as the Second Aliyah. Wolf Rawicki (later Ze'ev Raban) was born in Łódź, Congress Poland, and began his studies there. Genuine 1930 Print. From a folio of prints published 1930. This is an original 1930s print, not to be confused with the modern reprinted versions widely available. Wolf Rawicki (later Ze'ev Raban) was born in Łódź, Congress Poland, and began his studies there. Under the influence of Boris Schatz, the founder of the Bezalel Academy, Raban moved to the land of Israel in 1912 during the wave of immigration known as the Second Aliyah. 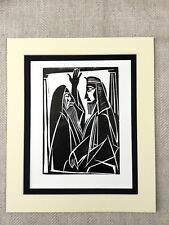 Rare Colour Lithograph Folio Plate from 'The Song of Solomon' Circa 1930 - Ze'ev Raban. Genuine 1930 Print. From a folio of prints published 1930. This is an original 1930s print, not to be confused with the modern reprinted versions widely available. From a folio of prints produced by the renown artist Raphael Mohar for for his Jeremiah The Prophet Series. This is an original 1960s print from that series, not to be confused with the modern reprinted versions widely available. 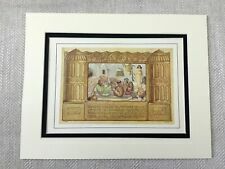 Rare Colour Lithograph Folio Plate from 'The Song of Solomon' Circa 1930 - Ze'ev Raban. Wolf Rawicki (later Ze'ev Raban) was born in Łódź, Congress Poland, and began his studies there. Ze'ev Raban. Under the influence of Boris Schatz, the founder of the Bezalel Academy, Raban moved to the land of Israel in 1912 during the wave of immigration known as the Second Aliyah. MARGINS AND PENCIL-SIGNED AND NUMBERED BY CHAGALL. Printed by Mourlot ,Paris 1956. ONE OF 6,500 UNSIGNED AND UNNUMBERED IMPRESSIONS ON VELIN PAPER. HERE IS AN ANTIQUE PRINT TAKEN FROM THE BOOK THE WORLD'S GREATEST PAINTINGS EDITED BY T LEMAN HARE NO DATE BUT DATES AROUND THE 1930S. THIS PRINT IS TITLED THE ANSIDEI MADONNA BY RAPHAEL SANZIO IT IS A COLOUR PASTE DOWN PICTURE LOOSELY ATTACHED TO PAGE AND IS ONE OF THE PAGES FROM BOOK.PRINT READY FOR MOUNTING AND FRAMING AND HAS BEEN CAREFULLY REMOVED FROM BOOK. Unusual embossed image of what appears to Dewi Sri / Hindu Goddess. The image is on paper / papyrus. It appears to have been embossed and then dyed or inked to highlight the image. Artist: Eveleen Buckton. Eveleen Buckton was a pupil of Frank Short. Her works were mainly landscapes and she exhibited with the New English Art Club and the Royal Academy. Signed: Signed in pencil lower right E. Buckton. This listing is for a single vintage print from John Marin's body of work. It is of a watercolor titled Phippsburg, Maine. ►Condition: This is a vintage print in like new condition. It has been kept in the original packaging since printing & distribution, away from light. No bends, tears, discoloration, or other issues. It will be shipped rolled in a wide tube. ►Shipping: Additional rolled paper items SHIP FOR FREE. Applies to domestic and international orders. ►Related: This store has several other John Marin prints from the same collection available, as well as a set of 5 prints. See the full description for links.. The coming of the Saviour was prophesied by Prophets of Israel and Sibyls of the Classical world, and the various components of the ceiling of the Sistine Chapel are linked to this Christian doctrine. The person, Jonah, is of prophetic significance in Christianity. The coming of the Saviour was prophesied by Prophets of Israel and Sibyls of the Classical world. The various components of the ceiling of the Sistine Chapel are linked to this Christian doctrine. The coming of the Saviour was prophesied by Prophets of Israel and Sibyls of the Classical world. The various components of the ceiling of the Sistine Chapel are linked to this Christian doctrine. The Prophet Joel. The Prophet Zechariah. The coming of the Saviour was prophesied by Prophets of Israel and Sibyls of the Classical world. The various components of the ceiling of the Sistine Chapel are linked to this Christian doctrine. This is an authentic engraving (copper plate), by the important Greek painter and engraver Lykourgos Kogevinas (1887-1940), in the year 1924. Subject: "Temple of Olympian Zeus, in Athens". Illustrated on the catalog. This is an authentic engraving (copper plate), by the important Greek painter and engraver Lykourgos Kogevinas(1887-1940). Subject: "Le Monastere de Diochiariou". Is in very good condition. " Le Mont Athos ". Series: AD "Les Grands Graveurs: Albert Durer". The prodigal son kneels, hands clasped, in the manure of the pig sty. The pigs seem to be depicted as ferocious boars. Title : L'ENFANT PRODIGUE (The Prodigal Son). No visible dot matrix or color separation. The print shows age-related wear, tanning around the border, slight fade throughout, water spots around border areas. Tape on the bottom of paper backing. The Cumaean Sibyl. The coming of the Saviour was prophesied by Prophets of Israel and Sibyls of the Classical world, and the various components of the ceiling of the Sistine Chapel are linked to this Christian doctrine. Artist : Nicholas Roerich (1874 - 1947). made on unique linen textured paper that is heavy and fingerprint resistant. 20th CENTURY MUSEUM ART PRINT. Museum of original : Sri Chitra Art Gallery, Trivandrum, India. The Persian Sibyl. The coming of the Saviour was prophesied by Prophets of Israel and Sibyls of the Classical world, and the various components of the ceiling of the Sistine Chapel are linked to this Christian doctrine. An engraving of the Holy Trinity, Mary, Jesus and Joseph. A tiny insect (butterfly, dragonfly, mayfly or locust depending on the translation) is placed at the lower right corner. Series: AD "Les Grands Graveurs: Albert Durer". The Prophet Isaiah. Year Issued: ca. 1950, Italy. This plate is part of an unbound publication by Roberto Hoesch of the art of the Italian Renaissance. The print is over 65 years old. This would make a unique and thoughtful present for a collector of Catholic Art. The Delphic Sibyl. The coming of the Saviour was prophesied by Prophets of Israel and Sibyls of the Classical world, and the various components of the ceiling of the Sistine Chapel are linked to this Christian doctrine. The coming of the Saviour was prophesied by Prophets of Israel and Sibyls of the Classical world. The various components of the ceiling of the Sistine Chapel are linked to this Christian doctrine. The Prophet Daniel. Artist : Nicholas Roerich (1874 - 1947). Museum of original : Nicholas Roerich Museum, New York, USA. Year of creation : 1934. made on unique linen textured paper that is heavy and fingerprint resistant. Series: AD "Les Grands Graveurs: Albert Durer". Artist: Albrecht Dürer. Reverse: Printing (minimal)About the artist: Albrecht Dürer (German) 1471 – 1528 was a painter, printmaker and theorist of the German Renaissance. This is not a reproduction or later printing but the original print published as part of Salvador Dali's iconic Biblia Sacra suite. Salvador Dali was commissioned by the Alabretto family in 1963 to produce the images for the Biblia Sacra.